Bellydance head ornament with gold or silver finish, one size fits all. With multi, black, blue or turquoise glass charms and a scarab beetle ornament in front, this belly dance head dress adjusts to fit with both the top chain and side chain. FREE SHIPPING when purchased with other item. Don't forget to check out the matching anklet #196, and Necklace #156. Shipping Dimensions: 4.40" x 5.50" x 2.20"
If you don't see what you're looking for, explore the other pages of this site: Bellydance head ornament with gold or silver finish, one size fits all. 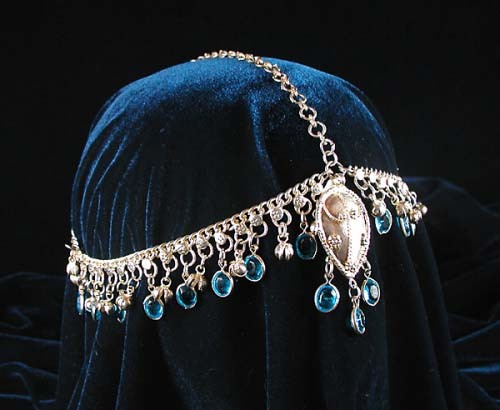 With multi, black, blue or turquoise glass charms and a scarab beetle ornament in front, this belly dance head dress adjusts to fit with both the top chain and side chain. FREE SHIPPING when purchased with other item. Don't forget to check out the matching anklet #196, and Necklace #156. Belly dance head dress, chiffon belly dance head dress, beaded belly dance headdress, belly dance headwear. Belly dance costume, belly dance hip scarf, belly dance zills, dancing swords, belly dance coin tops, belly dance choli tops, coin tops, harem pants, and belly dance jewelry.